Seattle offers great hikes down by Puget Sound or up in the surrounding Mountains and Foothills. Listed below are some of the best hikes around the Seattle area for hikers. A "must do" Best Seattle Hike which leads up about 1900 feet up the mountain to a great lake at the top. The trail is 90% covered by trees and makes for a great hike on hot Seattle summer days. Fantastic views along the way up and at the lake. Read more info in this book: Take a Hike Seattle. Fairly easy hike up a 1,100 elevation gain to some fantastic views of the Cascades, including Mount Si. But go early - its extremely popular on the weekends. Read more info in this book: Take a Hike Seattle on page 174. 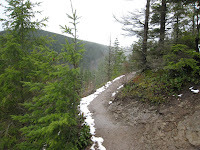 A good "sampler" of Cascade hiking with rocky trails, old forests and some fantastic views. Like Rattlesnake Ledge, it can get very busy if you dont go early. Read more info in this book: Take a Hike Seattle on page 178. This a very nice trail, offering great views of Mount Rainier and the North Mowich Glacier. The hike ends in a meadow covered in wildflowers. Getting there is a pain, but its well worth it.